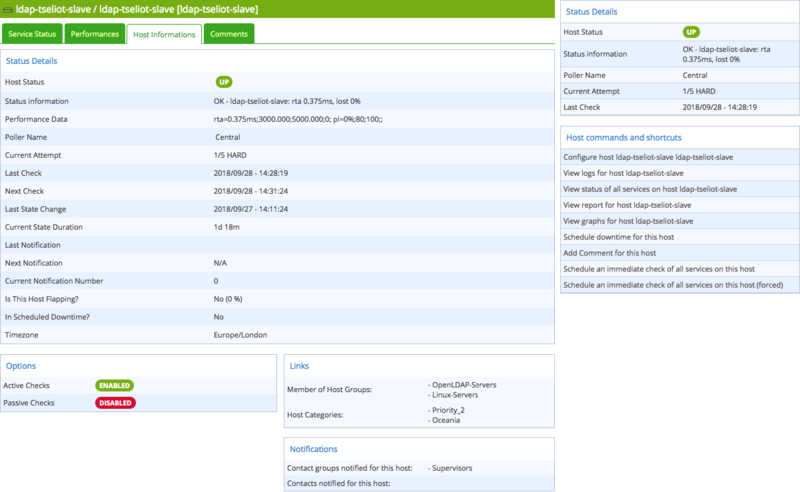 The Monitoring menu can be used to view the evolution of the supervision of its information system in real time. Statuses are indicators for the hosts or the services. Each status has a precise meaning for the object. 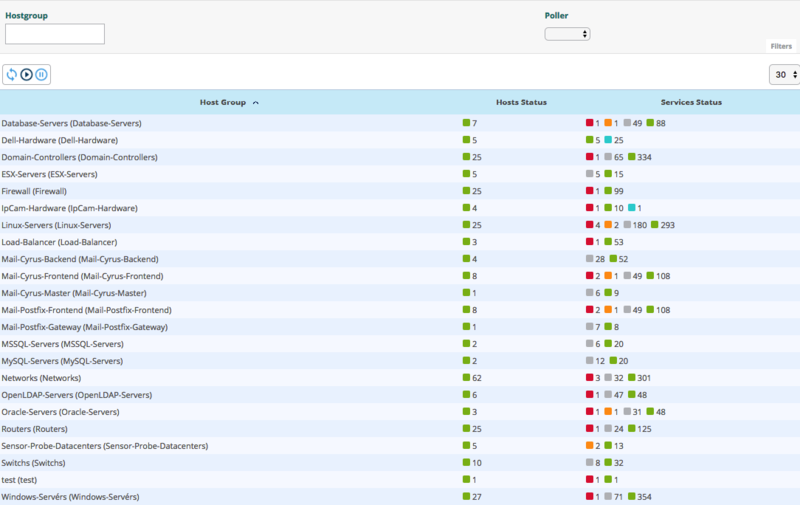 To each status corresponds a code generated by the monitoring plugin according to thresholds defined by the user. The table below summarizes all the possible statuses for a host. The table below summarizes all the possible statuses for a service. The PENDING status is a status displayed for a service or a host freshly configured but which has not yet been checked by the scheduler. The UNREACHABLE status is a status indicating that the host (parental relationship) is situated downstream of a host with a DOWN status. The FLAPPING status is a status indicating that the status change percentage of the object is very high. This percentage is obtained from calculations performed by the network monitoring engine. The ACKNOWLEDGED status is a status indicating that the incident of the service or of the host has been taken into account by a user. The DOWNTIME status is a status indicating that the incident of the service or of the host occurred during a downtime period. SOFT: Signifies that an incident has just been detected and that it has to be confirmed. HARD: Signifies that the status of the incident is confirmed. Once the status is confirmed, the notification process is engaged (sending of a mail, SMS, etc.). An incident (Not-OK status) is confirmed as of the moment when the number of validation attempts has reached its end. The configuration of an object (host or service) requires a regular check interval, a number of attempts to confirm a Not-OK status and an irregular check interval. As soon as the first incident is detected, the state is “SOFT” until its confirmation into “HARD”, triggering the notification process. Instant t + 0: The service is checked, it has the OK status. Instant t + 5: The second check shows that the service has the CRITICAL status. The service goes into the SOFT state (attempt 1/3). Instant t + 6: The third check is performed, the service still has the CRITICAL status in SOFT (attempt 2/3). Instant t + 7: The fourth check shows that the service still has the CRITICAL status (attempt 3/3). The number of tests has been completed; the state is configured (HARD). The notification process is triggered. Instant t + 8: The service recovers OK status. It goes directly into the HARD state. The notification process is triggered. Instant t + 13: The service has the WARNING status. It goes into the SOFT state (attempt 1/3). Instant t + 14: The service still has the WARNING status (attempt 2/3). Instant t + 15: The service has the CRITICAL status. It remains in the SOFT state because it has changed status. Serves to refresh the results manually. Serves to put the automatic data refreshment into pause. Serves to restart automatic data refreshment. You can use filter to adapt the view. 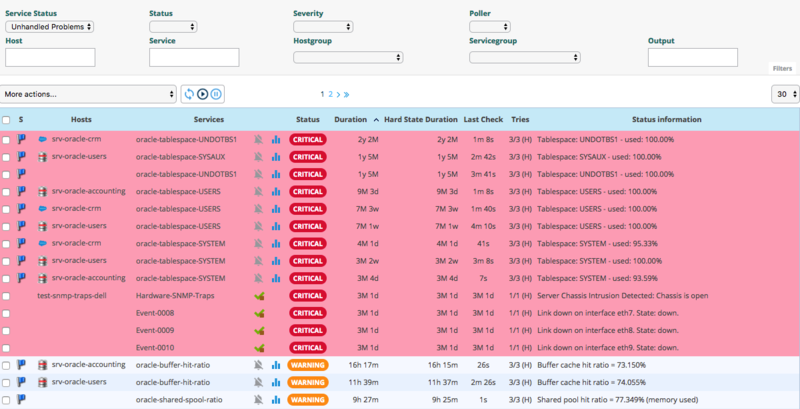 To view the hosts with a problem but not acknowledged, choose Unhandled Problems in Host Status filter. To view all the hosts with a problem, choose Host Problems in Host Status filter. To view all the hosts, choose All in Host Status filter. S Displays the severity level of the host. Hosts Displays the name of the host. The icon indicates that the notifications for this host are disabled. The icon can be used to view all the performance graphs for this host. Status Serves to view the status of the host. IP Address Indicates the IP address of the host. Last Check Displays the date and the time of the last check. Duration Displays the time that the host a has kept its current status. Hard State Duration Displays the time that the host a has kept its current hard state (does not appear when viewing of all the hosts). Tries Displays the number of tries before confirming the state. Status information Displays the message explaining the status of the host. The severity column and the associated filter appear if at least one object displayed has a severity level. Host: can be used to filter by name of host via an SQL LIKE type search. Status: can be used to filter by the status of hosts. Severity: can be used to filter by severity. Poller: can be used to filter the hosts by poller. Only the hosts of the poller selected will be displayed. Hostgroup: can be used to filter by host group. Only the hosts of the host group selected will be displayed. The search on text fields only starts after entry of at least 3 characters. Host Group List of available groups of hosts. Hosts Status Allows to display the number of hosts in UP, DOWN, UNREACHABLE or in PENDING status. 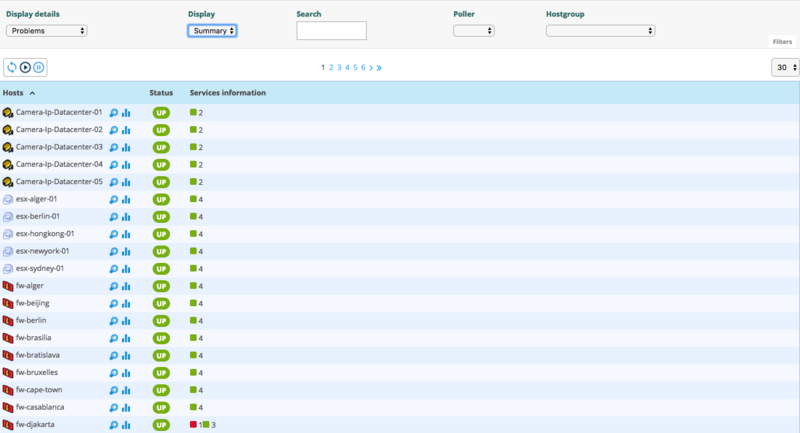 Services Status Allows to display the number of services in OK, WARNING, CRITICAL or in PENDING status. You can filter result by selecting poller in the select box. Only hosts monitored by poller will be displayed. Here is the listing of all services linked to the host. Host Status Displays the status of the host. Status information Displays the information of the status of the host. Performance Data Displays performance data associated to the check. Current Attempt Displays the number of attempts before status validation. State Type Displays the type of state (‘SOFT’ or ‘HARD’). Last Check Displays the last check of the host. Next Check Displays the next scheduled check of the host. Latency Displays the latency in seconds between the scheduled check and the real check execution. Execution Time Displays the execution time of the check. Last State Change Displays when the status of the host changed. Current State Duration Displays the date and time from which the host is in the present state. Last Notification Displays the sent date and time of the last notification. Next Notification Displays the sent date and time of the next notification. Current Notification Number Displays the number of sent notifications. Is This Host Flapping? Indicates if the host is in flapping state. Percent State Change Displays the percentage change of state. In Scheduled Downtime? Indicates if the host is in scheduled downtime. Last Update Displays the date and time of the last information update. Options and controls allow you to perform a number of actions on the host. Options are described in the chapter Exploitation guide. The Links container allows to display the hostgroups linked to the host. The Notifications container allows to display the contacts and contactgroups linked to the host which will receive notifications. To view the status of service, go into the Monitoring > Status Details > Services menu. The grey search bar can be used to filter the result displays. You can use filter to adapt the view. To view the meta services, go to Monitoring > Status Details > Services menu and filter with meta host. S Displays the severity level of the service. Host Displays the name of host. The icon allows to access to host’s page details. Services Displays the name of service. The icon indicates that notifications are disabled for this service. 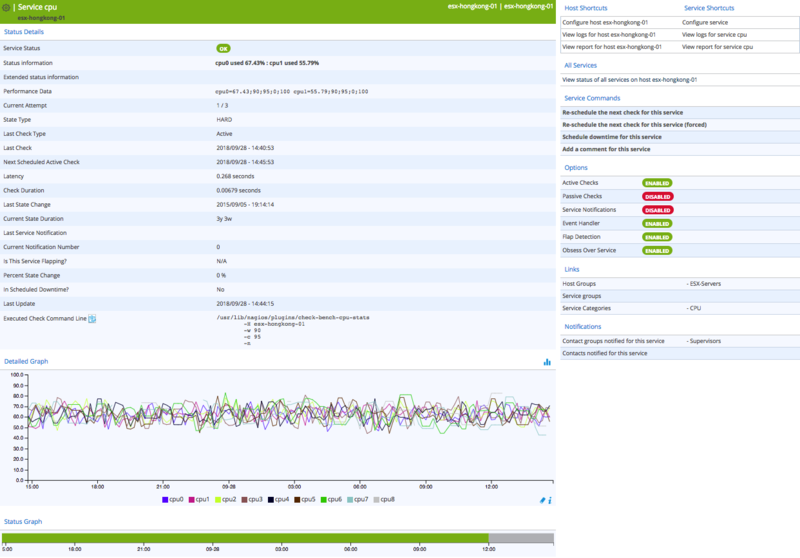 The icon Allows to display performance graphs of the service. The icon allows to access to service’s page details. Duration Displays the duration of the actual status. Last Check Displays the date and time of the last check. Tries Displays the number of attempts before status validation. Status information Displays the message explaining the status of the service. The Hard State Duration doesn’t appear in All Services menu. Host or Host Groups Hosts or Service Group Hosts Allows to display hosts or hosts linked to hostgroups or hosts linked to servicegroups. The icon allows to display all services linked to the host. 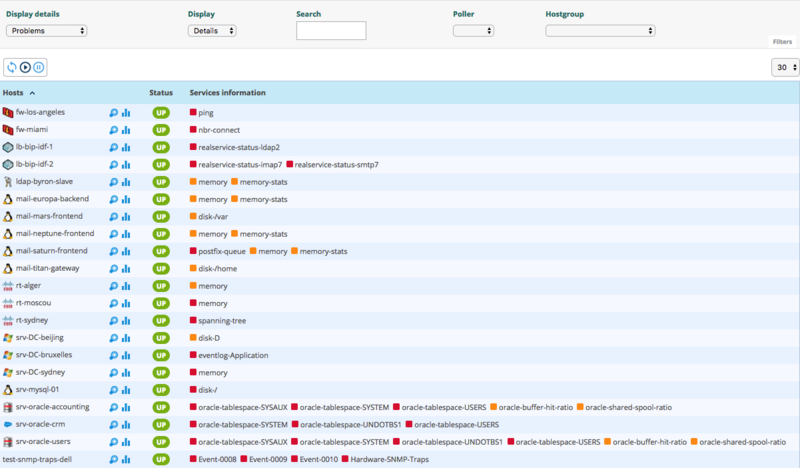 The icon allows to display all performance graphs of services linked to the host. Services information Displays the status of services (details mode) or the number of services classified by status (summary mode). Service Status Displays the status of the service. Status information Displays the information of the status of the service. Extended status information Displays long output of the service. Last Check Type Indicates if the last type of check is ‘active’ or ‘passive’. Last Check Displays the last check of the service. Next Scheduled Active Check Displays the next scheduled check of the service. Check Duration Displays the execution time of the check. Last State Change Displays when the status of the service changed. Last Service Notification Displays the sent date and time of the last notification. Is This Service Flapping? Indicates if the service is in flapping state. The Detailed Graph and Status Graph allow to display performance graphs and the history chart statutes for this service. Options are described in the chapter Exploitation guide. The groups of hosts which this service is linked. The groups of services which this service is linked. The categories of services which this service is linked. Host Name Indicates the name of host. Services Indicates the name of service. Start Time and End Time Displays the start and end date and time. Duration Displays the duration of the downtime. Author Displays the name of user who set the downtime. Comments Displays the comments linked to the downtime. Started Indicates if the downtime is started or not. Fixed Indicates if the start and end datetime if fix or not. Service: can be used to filter by name of service via an SQL LIKE type search. Output: can be used to filter by output of services. Author: can be used to filter by author. Display Finished Downtimes: allows to display recurring finished downtime. Display Recurring Downtimes: allows to display recurring downtime. The search on text fields only begins entering the third character. Services (only available of services page) Indicates the name of service. Entry Time Displays the date and time when comment had been written. Author Displays the name of user who set the comment. Comments Displays the content of the comment. Persistent Indicates if the comment is persistent when the monitoring engine restarts.